Warranty 5 yrs. on heat exchanger; 5 yrs. on parts & 1 yr. of reasonable labor within the first year of installation. 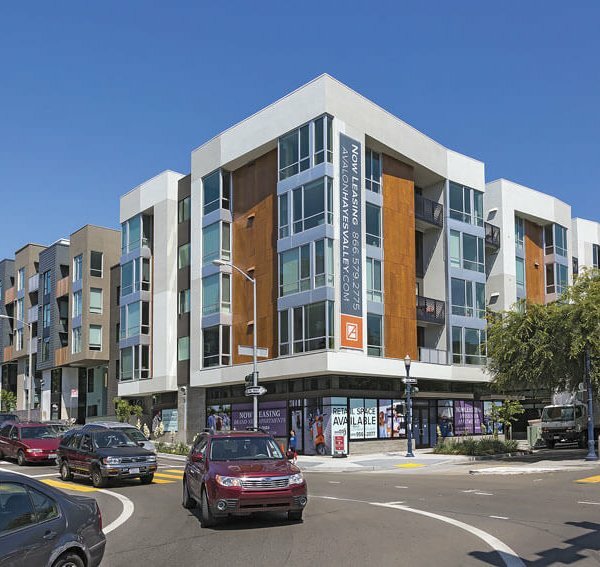 SAN FRANCISCO — When, in September 2015, the 182-unit Avalon Hayes Valley apartment complex in San Francisco was awarded LEED® Platinum Certification in the Multifamily Mid-rise category, it was only the most recent expression of the ongoing commitment of AvalonBay Communities to environmental sustainability and corporate responsibility in its properties. The latter now number 282 developments, containing nearly 83,000 apartment homes in 11 states and the District of Columbia, with another 27 communities under development. That same month, AvalonBay was named a leader in residential real estate by the annual Global Real Estate Sustainability Benchmark (GRESB) survey, which awarded the company a Green Star for its top ratings in the various environmental categories. In December, AvalonBay was named the 2015 Residential Leader in the Light by the National Association of Real Estate Investment Trusts 2014. In all, the company currently owns 16 LEED and 10 Energy Star certified communities. An additional 23 communities are pursuing certification. All of the above reflects the ambitious Corporate Responsibility Goals AvalonBay set for itself last year for achievement by 2020. These include a 15 percent reduction in “energy-use intensity” and “water-use intensity,” measured in kilowatt-hours (kWh) per foot and gallons per apartment dwelling, respectively. Responding to the California drought, AvalonBay has cut water consumption in its properties there by 12 percent over the past year, while LED lighting retrofits in 26 communities nationwide have netted annual energy savings of four million kWh, the equivalent of subtracting 577 passenger vehicles from the highway. Among the keys to AvalonBay’s success as a developer of sustainable properties is its willingness to take the long view on its investments, looking to maximize their impact on the local environment and community, as well as the health and safety of the residents. AvalonBay not only develops apartment parcels, serving as its own general contractor on all new building projects; but also continues to operate and maintain these communities after its construction crews have all gone home. 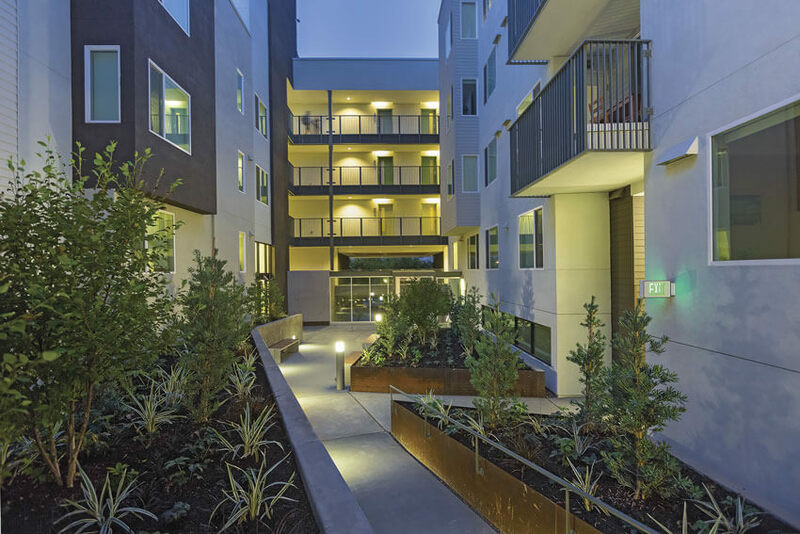 Earning LEED Platinum for both the East and West buildings at Avalon Hayes Valley — AvalonBay’s first Platinum certification — was no small achievement. The project, a podium-style structure with five levels of residential living in each tower situated over a single-level parking garage, accumulated a total of 81.5 points, a half-point above the Platinum threshold. But this “new” AvalonBay policy is, in large part, echoing current reality on the ground, according to Susie Maglich, Director of Design Resources, whose job is to manage design and construction standards for all new construction and redevelopment projects for AvalonBay. “Many of our construction teams have already pursued or achieved building certifications on our projects, which shows just how deeply AvalonBay has installed the sustainability message in our teams in recent years. Given AvalonBay’s emphasis on maximizing efficiency and sustainability, you might assume the company aggressively seeks out and embraces new building technologies. But while fully committed to innovation and the benefits it brings, the company treads carefully with new products on behalf of its properties and residents, according to Maglich. 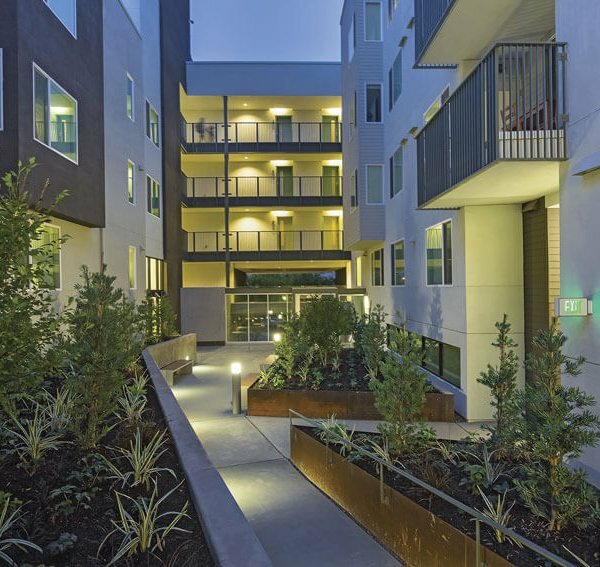 A good example of this piloting process — and another major contributor to the impressive LEED scores at Avalon Hayes Valley — is the buildings’ use of a solar-thermal-supported, tankless water heating system, manufactured by Noritz America, for all domestic hot water needs. 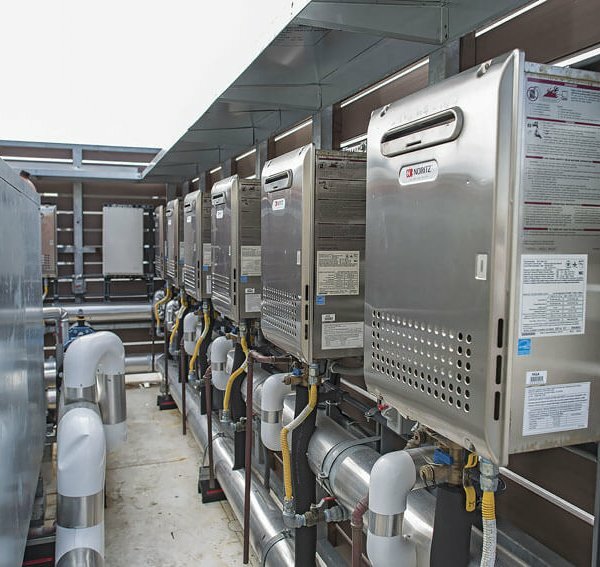 The installation at Avalon Hayes Valley is much larger and more complex than the individual Northeast systems, involving the centralized, rooftop placement of multiple tankless units to provide domestic hot water to all apartments. This is the second multi-unit, rooftop installation for AvalonBay. The first is a key feature at AVA 55 Ninth: a 17-story, 273-unit apartment building located in a similar San Francisco neighborhood a few blocks from the Hayes Valley buildings. Shortly after its completion in 2014, AVA 55 Ninth achieved LEED Gold. 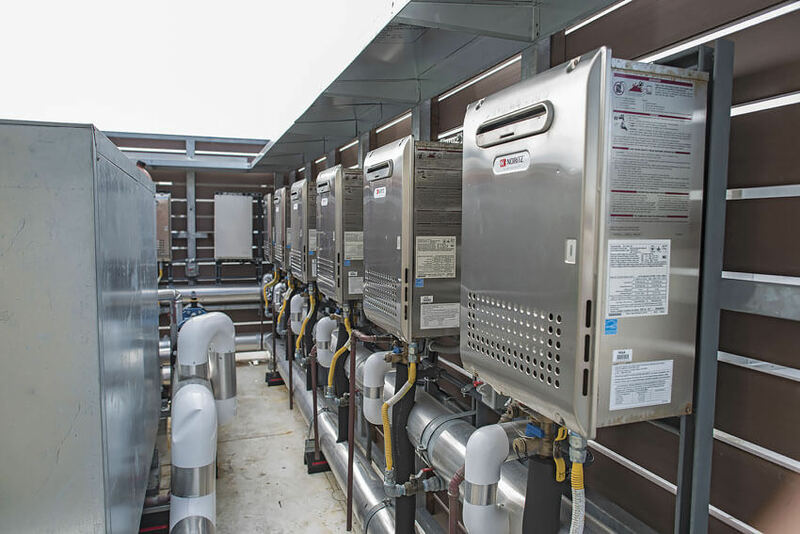 Like most proponents of tankless, AvalonBay appreciates the energy savings of on-demand water heating, as opposed to constantly reheating and storing hot water in large tanks in anticipation of its use. Maglich and her colleagues also like the dramatically smaller footprint that comes with eliminating the storage function. But while these attributes were apparent from the outset, AvalonBay still had questions about tankless — mainly having to do with the long-term, of course. “Because we hold onto the properties we build for many years, the maintenance and the operations sides of all these products and standards are very important to us,” says Maglich. “So we wondered how the move from conventional tank water heating to tankless would impact our Residential Services, group. 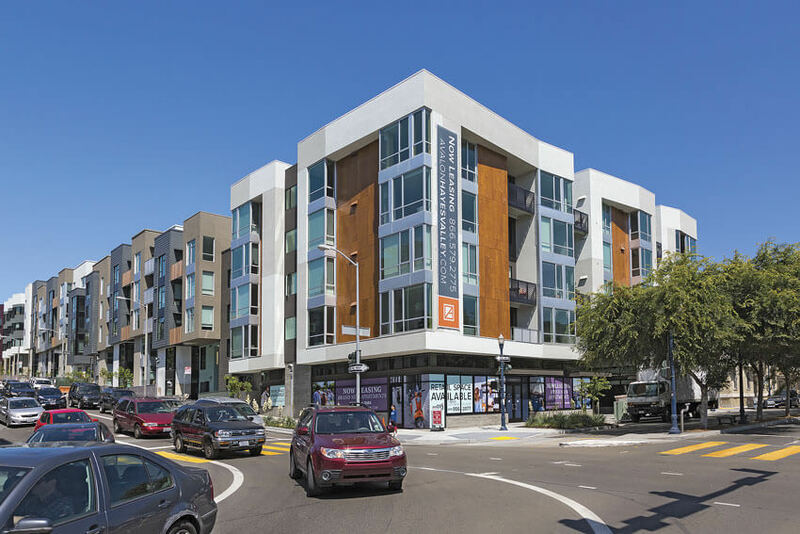 Both AVA 55 Ninth and AvalonBay Hayes Valley use 18 Noritz, commercial-grade NCC1991-DV condensing tankless water heaters to meet domestic hot-water needs, including apartment sinks and showers, janitorial sinks, and even a dog-washing area in the parking garage. 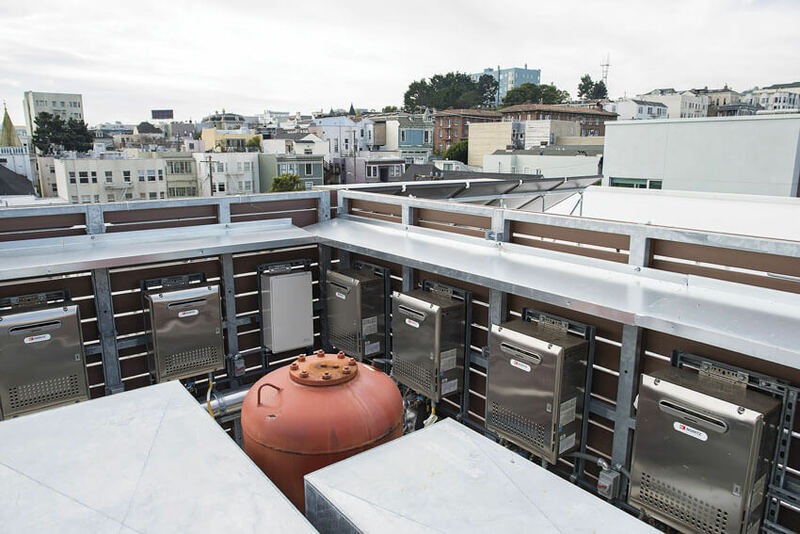 Both systems are rooftop installs, capitalizing on San Francisco’s year-round mild climate, although the 18 AVA units are sheltered inside a small mechanical room. Finally, the municipal water feeding both sets of tankless units are preheated by a solar thermal system to lighten the load, saving still more energy as well as wear and tear on the heaters. 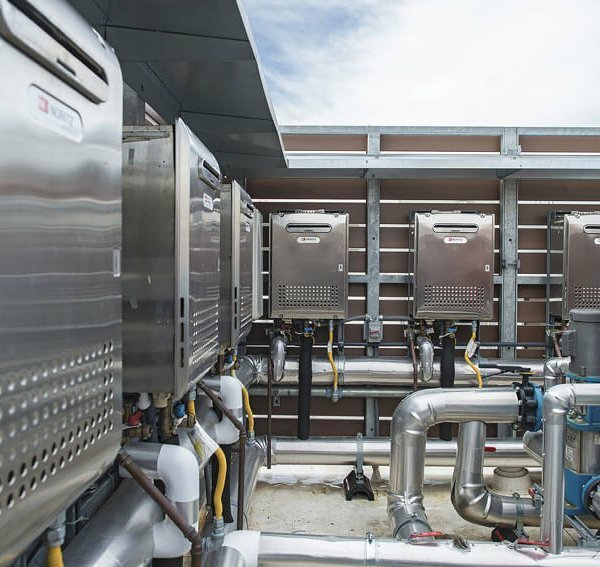 But while all 18 tankless units at AVA operate as a single, fully integrated system, the twin-tower construction at Hayes Valley required they be split into a pair of nine-unit systems. “A fully centralized system would have required extending the water heater return lines from one tower to another,” explains Design Engineer Jeff Koch, CPD, LEED AP, of ACCO Engineered Systems, which did both the design and the installation of the tankless units, plus the waste and vent systems, storm drainage, natural gas and fuel oil lines. 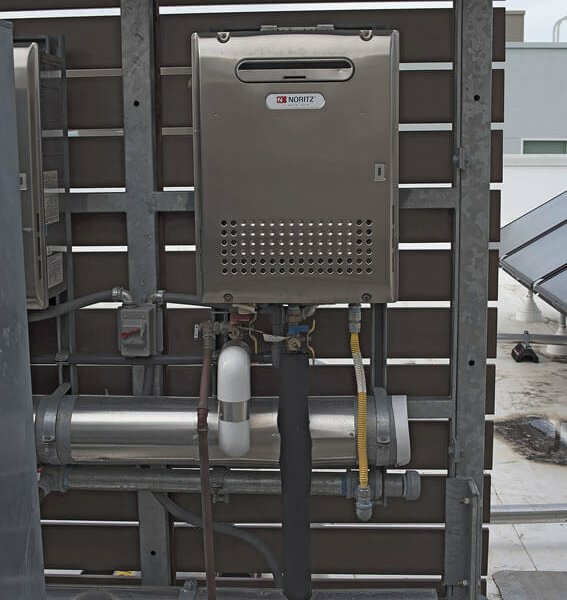 When a resident turns on a faucet or a shower, the tankless system at either tower senses the subsequent water flow and activates the burner in one of the nine rooftop units. If demand exceeds the capacity of that initial unit, the system controller will trigger a second tankless unit to fire, then a third, a fourth, and so on until the need is fully met. As demand subsides, the units shut down one by one. 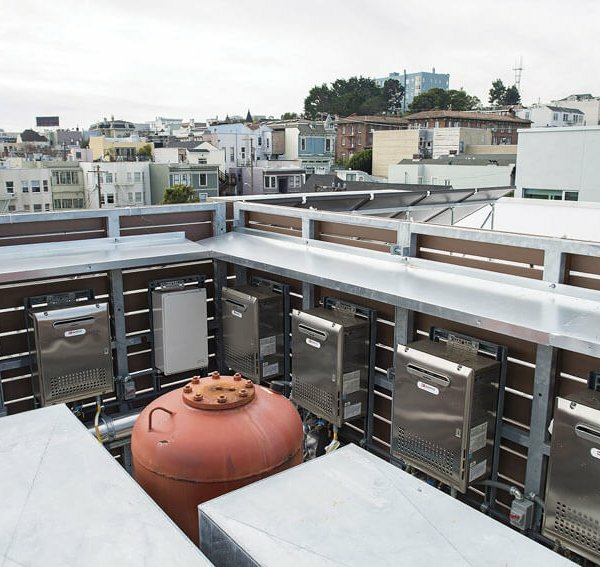 The water supply itself comes through the solar thermal system, which was designed and installed by Sun Light & Power of Berkeley, Calif. Also located on the rooftop, the system consists of 32 solar collectors on each of the two structures at Hayes Valley. 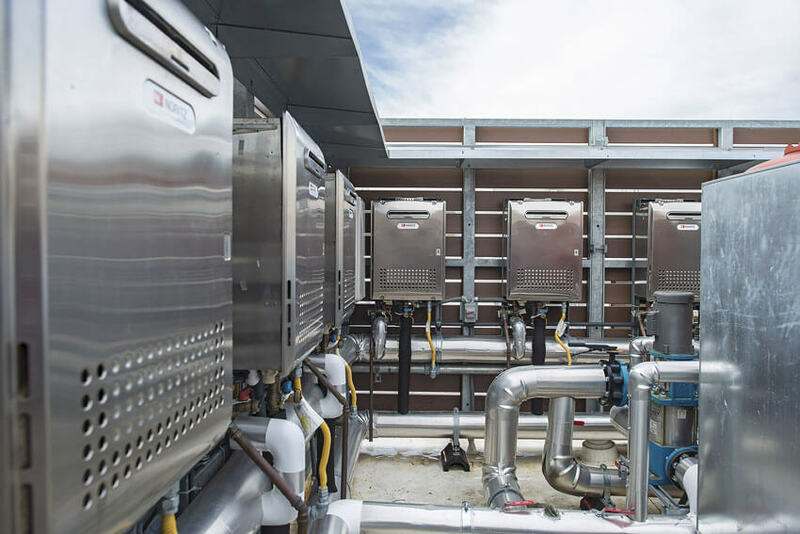 Each collector setup is connected to a pressurized, 1,950-gallon storage tank where the heat energy is stored, awaiting a call for hot water. When a demand for hot water arises, the solar thermal system preheats the water supply through a pair of heat exchangers: the first between the collectors and the pressurized tank; the second between the tank and the municipal water that actually enters the tankless units. The latter operation is controlled by a variable speed pump, a Grundfos MAGNA3, that cycles on and off with demand in response to the building’s DHW demand. The upshot: The glycol-water solution in the collectors never comes in contact with the buffered water in the storage tank, and the latter never infiltrates the DHW supply, thus eliminating any potential concerns over Legionella bacteria. The job of the solar collectors is to boost the temperature of the incoming water supply, so that the tankless units need not work so hard to meet the set point temperature of 120°F, according to Martin Morehouse, Solar Thermal Engineer, and Estimator at SLP. “The actual temperature-boost the system provides varies, depending on the available heat in the storage tank,” which itself depends on the available sunlight. During the cooler months, the solar collectors boost the incoming water by only 10°F to 20°F, with the system providing 30 to 40 percent of the heat energy required to meet demand. In summer, that “solar fraction” jumps to 80 percent, for a year-round average of 64 percent. Greenpoint’s become available when the renewable energy fraction reaches 40 percent, which is why AvalonBay was interested in the SLP system. But a few hours later when the entire building is in the shower, the heaters’ maximum outputs — 199,900 Btu/h per unit, or nearly 1.8 million Btu/h for all nine — should be more than sufficient to meet demand. 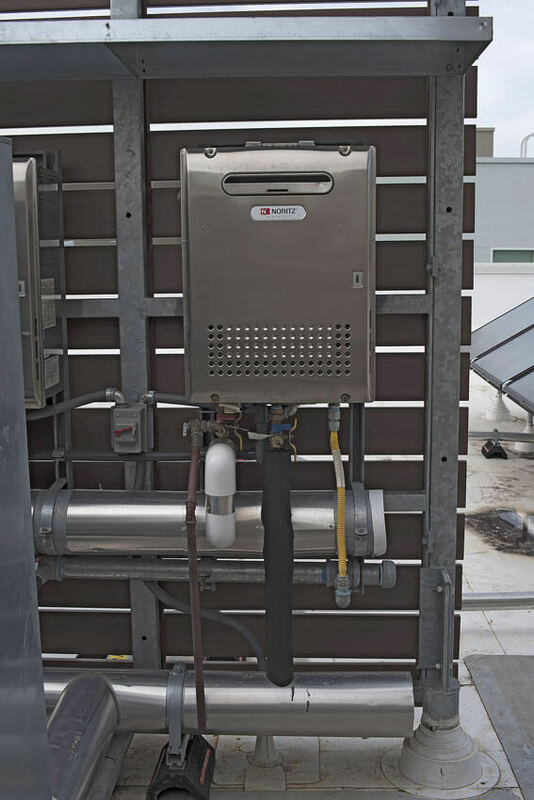 So tankless technology has the inside track for any commercial project involving ACCO? That is certainly the case when the company functions as the design-build contractor from the outset of a project. In such instances, “we will likely evaluate that project in a way that will lean toward tankless,” says Koch. But certain projects use a consulting engineer to handle the “Basis of Design,” which are concepts the owner-developer creates through a series of design coordination meetings with the various principals. But while every commercial project is far from a “slam-dunk,” Morehouse is excited about the prospects for solar —and tankless — in California, as the state drives toward a net-zero energy goal for new residential buildings by the year 2020. In fact, he expects low-rise and mid-rise structures to be seriously considered for inclusion on the new net-zero stipulation.